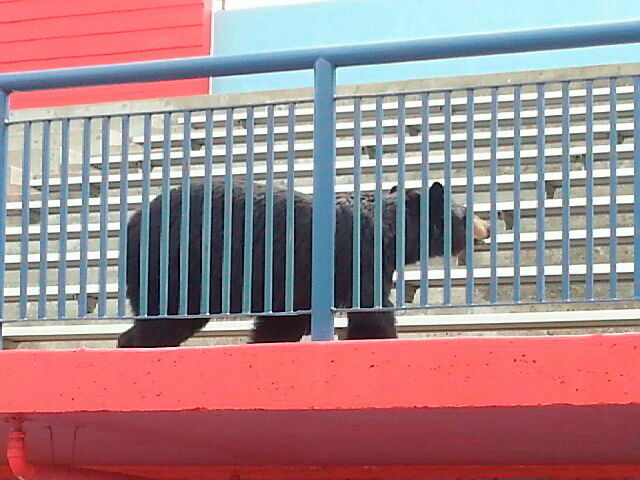 A mother black bear roams in the stands of the Laurentian track earlier this summer. Bears have been conspicuous of late, with both the local police service and natural resources staff experiencing a flood of calls. “There’s definitely been an increase in the complaints and we make our officers aware of them,” said Sgt. Randy Hosken of the Greater Sudbury Police Service. Police have fielded 720 bear-related calls so far this summer, which is more than double the 335 received last year at this time. In the past four days alone, there have been 110 complaints, resulting in 48 service calls due to potential safety concerns. The Ministry of Natural Resources, meanwhile, has experienced a tenfold spike in reports of Sudbury problem bruins. The ministry, which operates the Bearwise hotline, attributes the spike in urban bear concerns primarily to a drop in wild food sources.